Nutrition is supportive. If your goal is to build-muscle and get stronger, it doesn’t matter how “perfect” your nutrition is, or how much protein you eat, your potential for muscle-growth will be limited. A properly designed training program is essential. 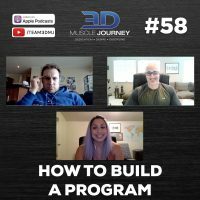 In today’s episode, Eric, Andrea and Jeff discuss all of the variables which play a role in program design. Beyond just covering the basics of volume, intensity and frequency, the group also touch on the different factors which come into play when designing a program for someone in the real-world. These factors include: psychology, injury, equipment availability, schedule, preferences and more. For those strength and physique athletes who program for themselves, and for coaches who work with this niche of athletes, this episode will be especially useful. Join us this week to learn many different valuable tools and strategies you can use in the art of programming. Tuned into the Apple Podcasts channel this morning and noticed that there is a metronome-like sound that plays over the track. Just an fyi! thanks for letting us know, Alex!!!! We are fixing that now and will have the updated audio posted on iTunes within the next hour. We really appreciate you telling us!!! howdy! Thanks so much for letting us know, Alex! We noticed a couple of hours later and had it fixed. Hopefully you have had the chance to listen to it now. If not, please feel free to check it out! But seriously, sorry about that. Some technical glitches as we switched editing software and were unaware of the presets. Promise it’s all fixed now! Outstanding Podcast as always. You guys have no idea how valuable this information has been to me (now you do), despite my 20 years of experience in the “Iron Game”/Industry. I also enjoy your guys humor and especially like Andrea’s unique brand of funny. Now for a question. Do you guys have a chart of some sort that classifies each exercise and which body parts they train in terms of setting up a program. A chart would be great if there one does not exist. How do you guys classify each exercise in terms of counting towards volume? For instance, Bench Press-do you guys count that as a Chest AND Tricep for sets? Same for Dips? Other exercises as well? So this is kind of a spoiler alert that I’m dropping here, but we are actually in the early stage of creating a VERY detailed library of exercise videos and instructional library about all the things you talked about. While you might be able to see it all come to life until the middle of 2018, it’s definitely in the cards for us. But at the moment, unfortunately no chart or list that we know of yet. That’s a damn good idea you have there. 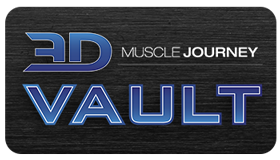 Will bring it up to the guys for sure 🙂 Perhaps that could even be an additional asset to the next edition of the muscle and strength pyramid books as well!